Can Iran Change Its Approach to the U.S.? Diplomats are hopeful that newly elected president Hassan Rouhani will finally be able to defuse long-running tension between the two countries. The tentative deal quickly fell apart. The Europeans promised little in return and soon after came the election of the hardline anti-American President Mahmoud Ahmadinejad, who renounced the freeze, broke the seals the International Atomic Energy Agency had placed on Iran's conversion facilities at Isfahan, and pushed ahead with work at other facilities, including the secret underground site called Fordo. Eight years later Ahmadinejad is gone and Iran is chafing under ever-tighter sanctions. And now Ahmadinejad's successor, Rouhani, is coming to New York for the annual meetings of the U.N. General Assembly next week, seeking a meeting with President Obama and telling NBC News on Wednesday that this time he has “sufficient political latitude” to negotiate a lasting pact that could end the threat of war between Iran and the United States. In February, the U.S. and the West imposed some of the toughest sanctions yet, cutting off a substantial portion of Tehran's access to its oil-generated foreign reserves in overseas banks. According to estimates provided to The Associated Press at the end of August, Iran is unable to access 44 percent of its monthly earnings from crude oil exports, raising doubts about Tehran's ability to prop up its plummeting currency, the rial, and stop inflation. Rouhani's speech at the U.N. next week is also expected to mark a dramatic difference from Ahmadinejad's fiery addresses. At his inauguration—to which he invited Javier Solana, the former European nuclear negotiator, and other Western officials—Rouhani promoted the idea of engagement and moderation in a bid to end sanctions. Other reports suggest that the Iranian economy remains resilient, and Iran hawks caution that there has always been reason to doubt Rouhani's sincerity. The soft-spoken president has proved skilled in the past at buying time by appearing reasonable and conciliatory, even as he, like others in the Islamic regime, has committed himself to moving ahead with uranium enrichment. 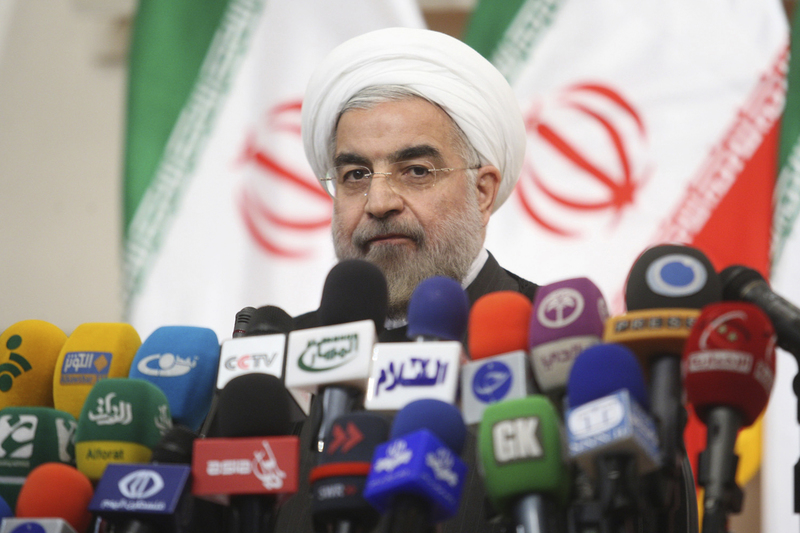 In a speech in 2005, Rouhani described how Iran's strategy was to divide the West, playing America's hardline position off against others of the five veto-bearing permanent members, including China and Russia, along with Germany. He acknowledged exploiting “the intense competition” among Western countries in nuclear negotiations, saying “we can use that competition to our advantage.” The International Atomic Energy Agency concluded earlier this year that Iran is speeding up its accumulation of nuclear material and installing next-generation centrifuges. Still, a softer tone coming from Khamenei and the return to power of Zarif, Iran's former U.N. ambassador in New York, suggests that this could indeed be a genuine new effort to find compromise. Zarif has often sought to create new channels of discourse with Washington, which broke relations with Tehran in 1980 after the hostage crisis, although he, like Rouhani, has almost always failed. Starting when he was deputy foreign minister attending a 2001 conference in Bonn on the governance of post-Taliban Afghanistan, Zarif regularly dined and had coffee with the American delegate, James Dobbins (who is today the Obama administration's special representative for Afghanistan and Pakistan). In an interview in the mid-2000s, Dobbins recalled that Zarif made a number of constructive suggestions throughout the meeting. “Once, in late November, we were having coffee in one of the sitting rooms after [the U.N. representative] circulated a draft of the agreement laying out the new Afghan government,” Dobbins recalled. “Zarif said, with a certain twinkle in his eye: ‘I don't think there's anything in it that mentions democracy. Don't you think there could be some commitment to democratization?’ This was before the Bush administration had discovered democracy as a panacea for the Middle East. I said that's a good idea.” The provision was added. “Then he said, ‘It also doesn't mention international terrorism. Don't we think the new Afghan government ought to be committed to fighting international terrorism?’ As far as I know that was put in too,” Dobbins said. “The Iranians really do think they run a democratic society, in which even the Supreme Leader is elected, albeit indirectly.” Dobbins said that Zarif helped him by pressuring the Afghans to come to agreement on the new government at a critical moment. Zarif was also instrumental in an abortive secret attempt in the spring of 2003, using the then-Swiss ambassador to Tehran, Tim Guldimann, as an intermediary, to start up broad-based talks with the United States on major outstanding issues, including the nuclear program and Iranian support for Hezbollah. None of these negotiations succeeded, but they may provide something to build on a decade later. Rouhani and Zarif have been on a Western charm offensive in recent days, even tweeting Rosh Hashanah greetings on the occasion of the Jewish New Year, a clear departure in tone from the virulently anti-Semitic Ahmadinejad and his hardline government. “I don't think it's a gimmick,” says Burns. “I think the Iranians are clearly trying to position themselves to establish a good basis for talks with the United States.” But he, like other diplomats, says the only proof will come if Tehran agrees to what should be Washington's opening position: the various U.N. Security Council resolutions dating back to 2006 that demand that Tehran cease the enrichment of uranium.